Good news, you can still find great vacation packages for a late summer or early fall getaway. Go to the Bahamas with this LibertyTravel package and bath in the ocean maybe for the last time this year, lie in the send and drink a cocktail without thinking of the work and the cold that is coming with the Fall. 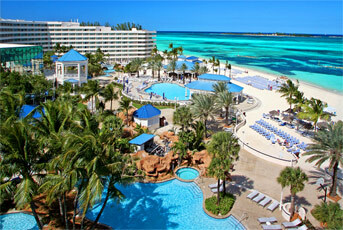 Depart from Miami, FL, fly to Nassau and stay in the four-star Sheraton Nassau Beach Resort for just $489. Other departure cities are available for a surcharge – i.e. with Boston departure $549, with Chicago departure $559. Prices do not include taxes and fees and are shown per person based on double occupancy. You can travel between September 1 and December 22 to enjoy 6 nights of leisure in this four-star Nassau resort. But hurry , there are only 3 days left to book as the offer end on August 28, 2011. Your speed will be rewarded though as you can save up to 50% compared to regular rates, you get a $400 air credit per room and your kids under 4 stay and eat free in the hotel. Sheraton Nassau Beach resort features three pools, a whirlpool, a swim-up bar, Kids Club for children, various dining options, bars, evening activities like lessons, wine tastings and different games. During the day you can take golf courses, practice water sports or just enjoy a jacuzzi or one of the heated pool outside the hotel. Please note that Sheraton Resort is completely cigarette-free. This entry was posted on Thursday, August 25th, 2011 at 6:16 am and is filed under Vacation Package Deals. You can follow any responses to this entry through the RSS 2.0 feed. You can leave a response, or trackback from your own site.